For courses in two-semester general chemistry. 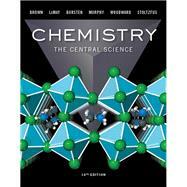 Unrivaled problem sets, notable scientific accuracy and currency, and remarkable clarity have made Chemistry: The Central Science the leading general chemistry text for more than a decade. Trusted, innovative, and calibrated, the text increases conceptual understanding and leads to greater student success in general chemistry by building on the expertise of the dynamic author team of leading researchers and award-winning teachers. In this new edition, the author team draws on the wealth of student data in Mastering™ Chemistry to identify where students struggle and strives to perfect the clarity and effectiveness of the text, the art, and the exercises while addressing student misconceptions and encouraging thinking about the practical, real-world use of chemistry. New levels of student interactivity and engagement are made possible through the enhanced eText 2.0 and Mastering Chemistry, providing seamlessly integrated videos and personalized learning throughout the course . Mastering™ Chemistry is the leading online homework, tutorial, and engagement system, designed to improve results by engaging students with vetted content. The enhanced eText 2.0 and Mastering Chemistry work with the book to provide seamless and tightly integrated videos and other rich media and assessment throughout the course. Instructors can assign interactive media before class to engage students and ensure they arrive ready to learn. Students further master concepts through book-specific Mastering Chemistry assignments, which provide hints and answer-specific feedback that build problem-solving skills. With Learning Catalytics™ instructors can expand on key concepts and encourage student engagement during lecture through questions answered individually or in pairs and groups. Mastering Chemistry now provides students with the new General Chemistry Primer for remediation of chemistry and math skills needed in the general chemistry course. Note: You are purchasing a standalone product; Mastering™ Chemistry does not come packaged with this content. Students, if interested in purchasing this title with Mastering Chemistry , ask your instructor for the correct package ISBN and Course ID. Instructors, contact your Pearson representative for more information. Mastering Chemistry should only be purchased when required by an instructor. THEODORE L. BROWN received his Ph.D. from Michigan State University in 1956. Since then, he has been a member of the faculty of the University of Illinois, Urbana-Champaign, where he is now Professor of Chemistry, Emeritus. He served as Vice Chancellor for Research, and Dean of The Graduate College, from 1980 to 1986, and as Founding Director of the Arnold and Mabel Beckman Institute for Advanced Science and Technology from 1987 to 1993. Professor Brown has been an Alfred P. Sloan Foundation Research Fellow and has been awarded a Guggenheim Fellowship. In 1972 he was awarded the American Chemical Society Award for Research in Inorganic Chemistry and received the American Chemical Society Award for Distinguished Service in the Advancement of Inorganic Chemistry in 1993. He has been elected a Fellow of the American Association for the Advancement of Science, the American Academy of Arts and Sciences, and the American Chemical Society. H. EUGENE LEMAY, JR., received his B.S. degree in Chemistry from Pacific Lutheran University (Washington) and his Ph.D. in Chemistry in 1966 from the University of Illinois, Urbana-Champaign. He then joined the faculty of the University of Nevada, Reno, where he is currently Professor of Chemistry, Emeritus. He has enjoyed Visiting Professorships at the University of North Carolina at Chapel Hill, at the University College of Wales in Great Britain, and at the University of California, Los Angeles. Professor LeMay is a popular and effective teacher, who has taught thousands of students during more than 40 years of university teaching. Known for the clarity of his lectures and his sense of humor, he has received several teaching awards, including the University Distinguished Teacher of the Year Award (1991) and the first Regents’ Teaching Award given by the State of Nevada Board of Regents (1997). BRUCE E. BURSTEN received his Ph.D. in Chemistry from the University of Wisconsin in 1978. After two years as a National Science Foundation Postdoctoral Fellow at Texas A&M University, he joined the faculty of The Ohio State University, where he rose to the rank of Distinguished University Professor. In 2005, he moved to the University of Tennessee, Knoxville, as Distinguished Professor of Chemistry and Dean of the College of Arts and Sciences. Professor Bursten has been a Camille and Henry Dreyfus Foundation Teacher-Scholar and an Alfred P. Sloan Foundation Research Fellow, and he is a Fellow of both the American Association for the Advancement of Science and the American Chemical Society. At Ohio State he has received the University Distinguished Teaching Award in 1982 and 1996, the Arts and Sciences Student Council Outstanding Teaching Award in 1984, and the University Distinguished Scholar Award in 1990. He received the Spiers Memorial Prize and Medal of the Royal Society of Chemistry in 2003, and the Morley Medal of the Cleveland Section of the American Chemical Society in 2005. He was President of the American Chemical Society for 2008. In addition to his teaching and service activities, Professor Bursten’s research program focuses on compounds of the transition-metal and actinide elements. CATHERINE J. MURPHY received two B.S. degrees, one in Chemistry and one in Biochemistry, from the University of Illinois, Urbana-Champaign, in 1986. She received her Ph.D. in Chemistry from the University of Wisconsin in 1990. She was a National Science Foundation and National Institutes of Health Postdoctoral Fellow at the California Institute of Technology from 1990 to 1993. In 1993, she joined the faculty of the University of South Carolina, Columbia, becoming the Guy F. Lipscomb Professor of Chemistry in 2003. In 2009 she moved to the University of Illinois, Urbana-Champaign, as the Peter C. and Gretchen Miller Markunas Professor of Chemistry. Professor Murphy has been honored for both research and teaching as a Camille Dreyfus Teacher-Scholar, an Alfred P. Sloan Foundation Research Fellow, a Cottrell Scholar of the Research Corporation, a National Science Foundation CAREER Award winner, and a subsequent NSF Award for Special Creativity. She has also received a USC Mortar Board Excellence in Teaching Award, the USC Golden Key Faculty Award for Creative Integration of Research and Undergraduate Teaching, the USC Michael J. Mungo Undergraduate Teaching Award, and the USC Outstanding Undergraduate Research Mentor Award. Since 2006, Professor Murphy has served as a Senior Editor for the Journal of Physical Chemistry. In 2008 she was elected a Fellow of the American Association for the Advancement of Science. Professor Murphy’s research program focuses on the synthesis and optical properties of inorganic nanomaterials, and on the local structure and dynamics of the DNA double helix. PATRICK M. WOODWARD received B.S. degrees in both Chemistry and Engineering from Idaho State University in 1991. He received a M.S. degree in Materials Science and a Ph.D. in Chemistry from Oregon State University in 1996. He spent two years as a postdoctoral researcher in the Department of Physics at Brookhaven National Laboratory. In 1998, he joined the faculty of the Chemistry Department at The Ohio State University where he currently holds the rank of Professor. He has enjoyed visiting professorships at the University of Bordeaux in France and the University of Sydney in Australia. Professor Woodward has been an Alfred P. Sloan Foundation Research Fellow and a National Science Foundation CAREER Award winner. He currently serves as an Associate Editor to the Journal of Solid State Chemistry and as the director of the Ohio REEL program, an NSF-funded center that works to bring authentic research experiments into the laboratories of first- and second-year chemistry classes in 15 colleges and universities across the state of Ohio. Professor Woodward’s research program focuses on understanding the links between bonding, structure, and properties of solid-state inorganic functional materials. MATTHEW W. STOLTZFUS received his B.S. degree in Chemistry from Millersville University in 2002 and his Ph. D. in Chemistry in 2007 from The Ohio State University. He spent two years as a teaching postdoctoral assistant for the Ohio REEL program, an NSF-funded center that works to bring authentic research experiments into the general chemistry lab curriculum in 15 colleges and universities across the state of Ohio. In 2009, he joined the faculty of Ohio State where he currently holds the position of Chemistry Lecturer. In addition to lecturing general chemistry, Stoltzfus accepted the Faculty Fellow position for the Digital First Initiative, inspiring instructors to offer engaging digital learning content to students through emerging technology. Through this initiative, he developed an iTunes U general chemistry course, which has attracted over 120,000 students from all over the world. Stoltzfus has received several teaching awards, including the inaugural Ohio State University 2013 Provost’s Award for Distinguished Teaching by a Lecturer and he is recognized as an Apple Distinguished Educator. STRATEGIES FOR SUCCESS What Now?